Port Arthur LNG and PGNiG officials at the agreement signing event. Credit: PGNiG SA. 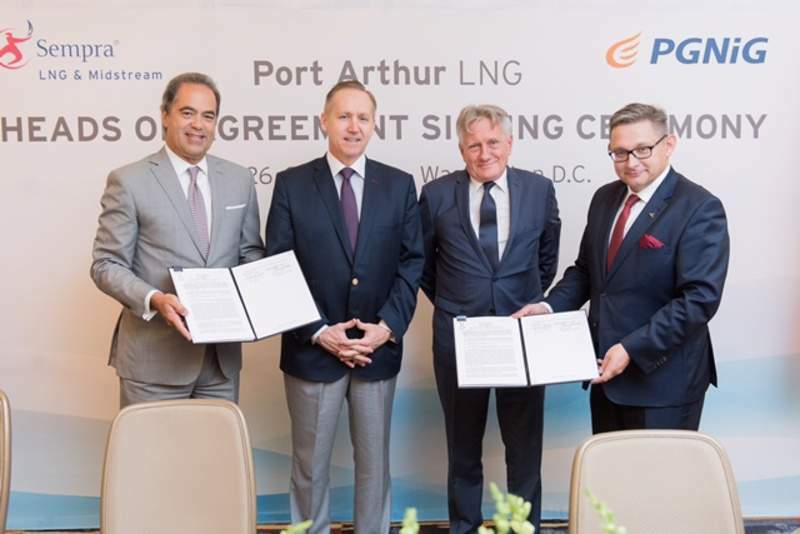 Sempra LNG & Midstream subsidiary Port Arthur LNG has reached an agreement with Polish Oil & Gas Company (PGNiG) for the delivery of liquefied natural gas (LNG) from the Port Arthur facility being developed in Jefferson County, Texas, US. The agreement contains basic terms and conditions of a contract, which will be finalised by the companies at a later date. Under the terms of the deal, Port Arthur will supply two million tonnes per annum (Mtpa) of LNG over a period of 20 years. The delivered LNG is equivalent to 2.7 billion cubic metres a year of natural gas following regasification. Port Arthur will begin cargo delivery from the LNG facility in 2023. Sempra president and chief operating officer Joseph Householder said: “The Port Arthur liquefaction project is one of three major LNG export projects Sempra Energy is developing in North America to meet the demand of global markets, including Poland. PGNiG can use the deliveries to consider further trading on international markets. Port Arthur aims to export around 11Mtpa of LNG from the facility. Last week, the company awarded an engineering, procurement, construction and commissioning (EPC) contract to Bechtel.